Due to a dislocated elbow and a non-refundable plane ticket, I found myself in Bangkok at the end of October with time and energy to kill. I figured I'd give myself a crash course in the Thai metal scene by hitting up some local metal record stores and seeing what they might recommend. A wiser, more measured person might have actually started that search on Google before reaching Thailand; but leaping into the unknown yelling "Adventure!" is kind of my thing, and I figure there's no changing me now. I started off in the much recommended Triple Six Records, a little shop in the basement of Century The Movie Plaza mall, next to the Victoria Monument train station. 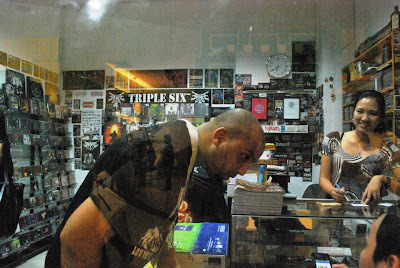 Triple Six has a great assortment of imported death, black and thrash CDs; unfortunately, at the time I stopped by they didn't have any local CDs in stock, which was the exclusive purpose of my visit. And since I haven't owned a cassette player since 2003, the rare local cassettes didn't hold much interest. But they did give me an impressive list of Thai bands to look for, which I took with me to the next location on my pilgrimage. In the sprawling, labyrinth-like Jatujak Market I found Heaven & Hell and its proprieter "M," who friends (including the Atomicdeath guys) helped to put in touch with me. At the beginning of my visit, M pulled out a huge stack of local CDs; with limited time on my hands, I cut it down to bands that were on my Triple Six list and bands that M deemed were essential/seminal. After an hour-long listening party, I left the shop with about a dozen CDs (and some generous donations by M). Safe to say, I could make a great mixtape with my haul (Ha! Ha! ...foreshadowing). The biggest find from my trip to Bangkok was Dei Tetra. Playing black metal with a female singer, Dei Tetra are already making themselves known outside of Asia with their Marduk-worthy anti-religious invective. Devotees of Flame is their new two song single, which comes with an embroidered patch for all you jacket patch kids out there. A good introduction the band and appetite whetter for their upcoming full-length. 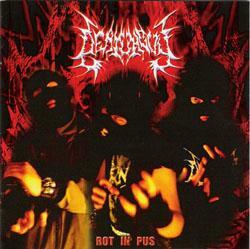 Revelations of Blasphemy is Dei Tetra's 2011 split EP with the Australian black metal band Naetu. Dei Tetra's side features four studio recordings and a lo-fi, fairly impenetrable live recording. Gasoline soaked, tinder burning fun. Naetu's no-frills black metal holds its own on the other side, with two new songs, two live recordings, and a cover of Zyklon B's "Warfare." Formed in 1992, Macaroni are one of Thailand's longest running death metal bands; I was kind of relieved to find out that their distinctly un-kvlt name was chosen on purpose and not out of some tragic lingual miscalculation. Working in the sometimes blasting, sometimes lurching style of Immolation, their new album A Gift for Corpse shows an aptitude for combining hyperblasting with seasickness-inducing grooves. Simply fantastic. Sometimes erroneously referred to as a demo, Cremation is Macaroni's first album, released on CD for the first time this year (it was first made available in 1996 on cassette). In the 16 years since this album was first issued, it has aged well - amazingly so, in fact. I'm enjoying this more than I ever have Incantation. 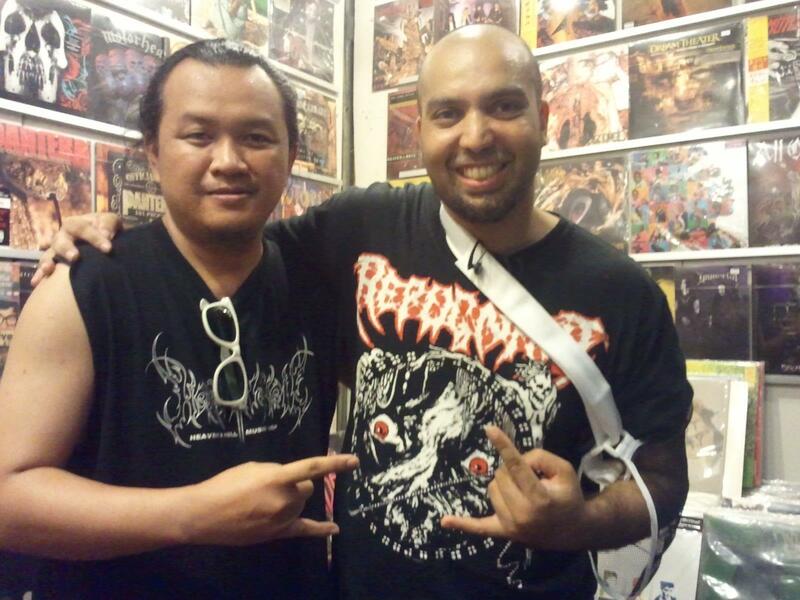 Deathguy, now disbanded, were another long-running Thai death metal band; Rot in Pus is a collection of their previous EPs, as well as a live show from Singapore and, for some reason, their final jam. The sound and production varies wildly throughout; the Singapore show, while interesting, is too muddily recorded to fill any need other than curiosity, while the songs from their debut EP are hampered by some pretty egregious drum machine abuse. 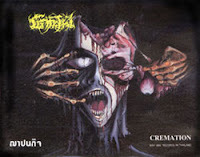 Still, a good overview of what I've been told is one of Thailand's seminal death metal bands. Soul of Revenge is the first EP from Lacerate, released back in 2002. This is brutal death metal that takes its cues from Cannibal Corpse and Suffocation, with the requisite slow mosh parts. Very accomplished for a debut, and hellishly enjoyable in its own right. I would love to see them on a SEA tour with Disgusted and Pus Vomit. Purgatory are another female fronted Thai extreme metal band, and I bought their two CDs EP Loke and Part 1 (The Earth). Like Grave's Soulless or even Amon Amarth at their chuggiest, Purgatory play mid-paced death metal with big grooves. The vocals, described by M as a female Glen Benton, are unbelievably low. It's solid stuff that's badly let down by the production, which is demo-quality at best. I know a lot of people like their metal raw as sushi, but the paper thin guitars and soda can drums aren't doing Purgatory any favours - especially as this style of death metal needs to sound as big and bottom heavy as it can. I desperately want to send them a copy of ProTools in time for their next recording. Maybe a kickstarter campaign to get them a decent recording budget is in order. 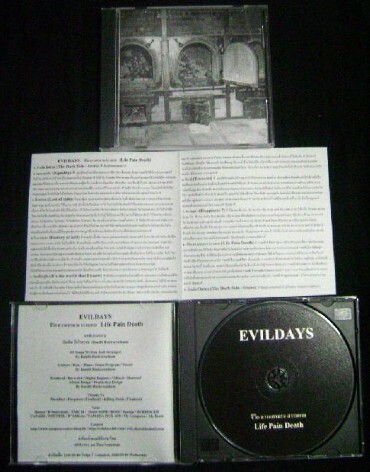 Evil Days is Killing Fields and Purgatory guitarist Bundit Ruckveratham's one man band, where he handles all the instruments and vocals. Unfortunately, Life Pain Death too often sounds like what it is - the solo album of a metal lead guitarist. Indulgent and often lacking in focus, it's as if these songs were odds and ends discarded by or written around his other bands. In addition, it sounds more like a pre-production mix and not a finished product. And the less said about the mixed-too-high programmed drums, the better. Bundit is clearly a gifted multi-instrumentalist with a fever, and the only prescription is more metal. He may someday burst out of the local scene as Thailand's answer to Dan Swanö; but this album won't be the vehicle he does it with. Big thanks to M at Heaven & Hell for his knowledge and patience, and the staff at Triple Six for their recommendations!